Jordan Allan is clearly enjoying his football at Coleraine, and he admitted that played a big part in his decision to stay at the club. The former Derry City striker has been in great form of late, and has nine goals to his tally already. A number of clubs were interested in the 21-year-old, but he was only too happy to commit his immediate future to the Bannsiders. “I am happy to get everything sorted out,” said Allan. “I had offers from clubs back home but I am enjoying myself here and the players are a great bunch of lads to work with. “As the saying goes, don’t fix what isn’t broken. 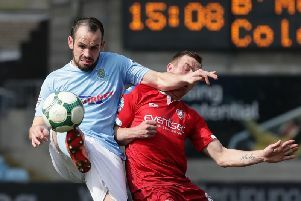 Allan had been developing a promising partnership with Eoin Bradley since his return to the club. Between them they had bagged six goals in the opening two games of their partnership. Unfortunately that thriving partnership will be out of action for a while now following Bradley’s unfortunate injury against Portadown on Saturday. But Allan clearly enjoyed playing alongside his new team-mate. “We only played with each other a couple of times, but the numbers speak for themselves,” he said. “Six goals in two games between us shows I think that we work well together. “There is a mutual respect for each other which is key. “Playing alongside Eoin is a boost for me and the team as he holds the ball up and allows me to come into play more in the pockets where I can affect the game. Boss Oran Kearney is delighted to have tied Allan to the club and further bolster his striking options.